As previously noted, people put most of the carbon dioxide into the atmosphere by burning fossil fuels (automobiles, coal burning, etc. ), resulting in a myriad of climate issues, including severe storms, droughts, and other natural stresses. Tackling this issue can take two forms: mitigation and/or adaptation. Adapt to the consequences. Adaptation is centered on dealing with existing warming/impacts of too much CO2 in the atmosphere that have already been created. We are at the point today that both mitigation AND adaptation efforts are needed. Luckily, trees can do both. Trees absorb and store carbon, reducing the amount of carbon dioxide (CO2) in the atmosphere. Trees constantly remove carbon dioxide from the atmosphere. One single large tree is able to absorb as much as 48 pounds of CO2 per year; one acre of trees consumes the same amount of CO2 released by driving an average car for 26,000 miles (Megalos 2015). In Charlotte, trees sequester 470,000 tons of carbon each year and store an additional 11.5 million tons over their lifetimes. This annual sequestration service is valued at $17 million, while the lifetime benefit of carbon storage is estimated at $418 million. Charlotte's trees absorb (or "sequester") 470,000 tons of carbon dioxide (CO2) from the atmosphere each year. This service is valued at almost $17 million annually. 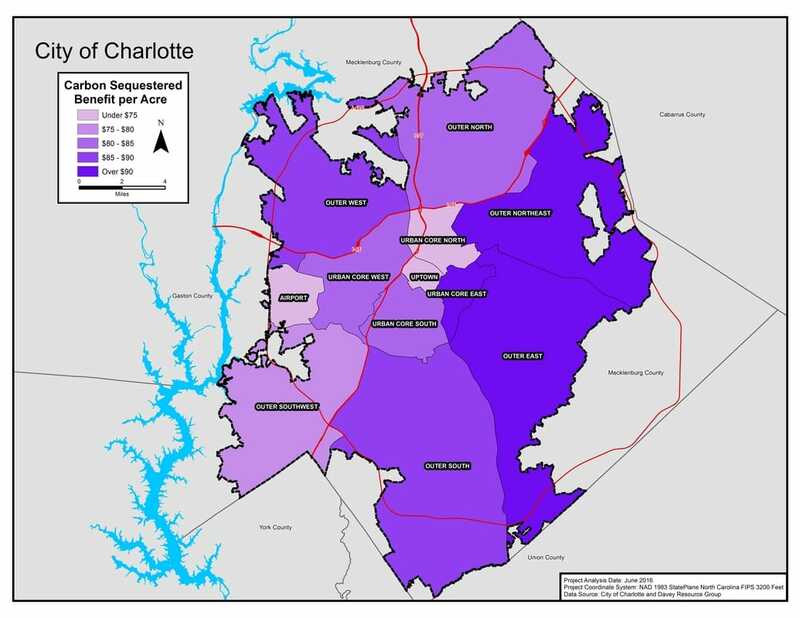 The map below shows the benefits trees provide in terms of carbon sequestration throughout the greater Charlotte area. Charlotte's trees absorb (or "sequester") 470,000 tons of carbon dioxide (CO2) from the atmosphere each year. This is a service valued at almost $17 million annually. In addition, over their lifetimes, Charlotte's trees will store another 11.5 million tons of CO2, a service valued at another $418 million.